You were like a cloth. Although filthy, you were washed. Saint Menignos was a fuller by trade from Parium, a Greek city of Adrasteia in Mysia on the Hellespont, and lived during the reign of Emperor Decius (249-251). When a royal decree was issued forbidding Christianity in the Roman Empire, many Christians were apprehended in Parium where they were imprisoned in a dark jail and placed in stocks. One night they prayed to our Lord Jesus Christ that they may be freed from the dark prison and their bonds, then suddenly a bright light appeared, they were loosed from their bonds, and they were able to escape from prison. This miracle soon became known to the pagans, who were amazed by what happened. 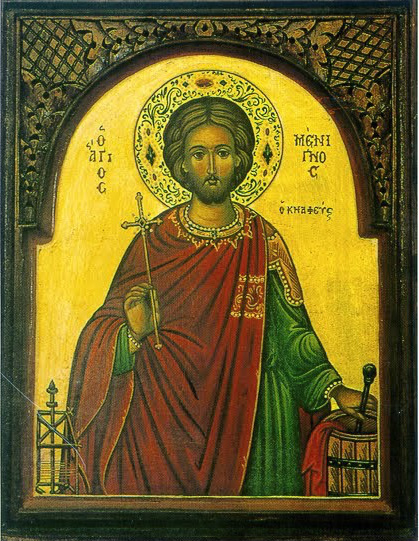 When Menignos heard about this miracle, he became inflamed with divine love and faith and the zeal for martyrdom. One day, when he was at the river where he washed clothes, Menignos heard a divine voice calling him to martyrdom. Not long after this, when the governor of that place was at court reading an imperial letter urging the governor towards the persecution of Christians, Menignos full of courage stood in his midst, and taking the letter he tore it into small pieces, then trampled on it. For this the governor had Menignos thrown to the ground and beaten, leaving him half dead. Then he was ordered to be suspended and scraped with an iron claw, to the point where his inward parts could be seen. Still the Martyr remained steadfast in his faith, prayed, and rebuked the governor. Then the governor ordered that his fingers be cut into small pieces, just as he cut into small pieces the letter of the emperor. When this was done, instead of blood, milk gushed forth from his wounds. He was then imprisoned overnight, and the next day, having confessed his faith in Christ once more, the governor ordered for his beheading. As Menignos was being led out to the place of his execution, his wife followed him weeping, along with others. 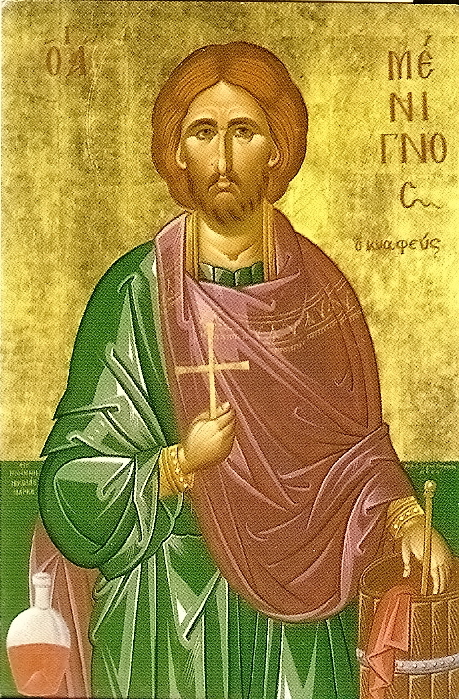 Upon his arrival, he stood before the witnesses to his execution and began to teach the people about Christ. After he entrusted his wife to the care of those he trusted, he was beheaded. Then a turtledove was miraculously seen to come out of the Martyrs mouth, which flew off into the sky, amazing all. Those who saw this miracle said, "Great and true is the God of Menignos!" 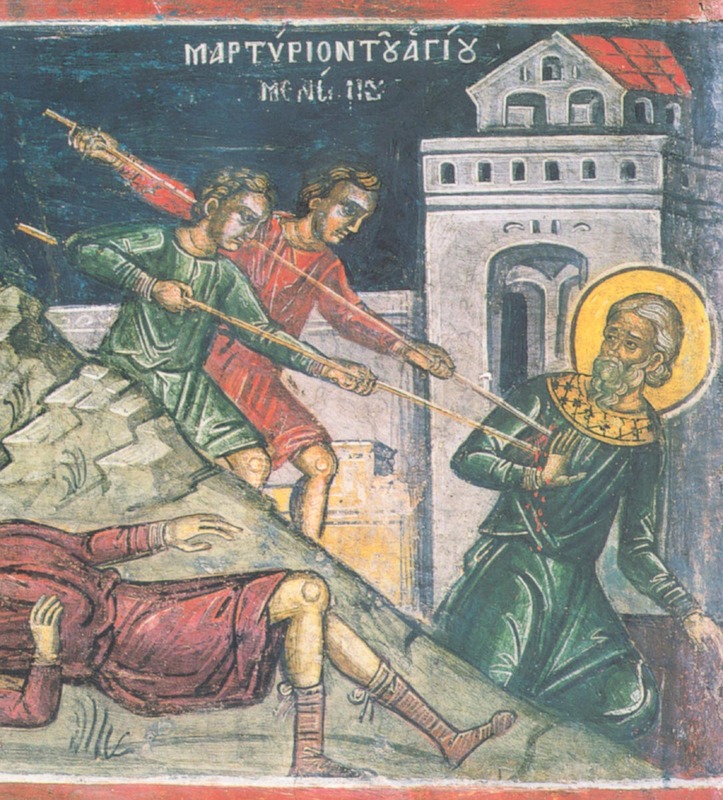 This enraged the governor, who ordered the body of Menignos to remain unburied so that God Himself could come down and bury him, and he set soldiers to guard the body. However, his brothers came by night and took his body while the soldiers slept, and they brought it to a place the Saint had told them where he desired to be buried. Along the way the brothers grew tired and they lay down to sleep. 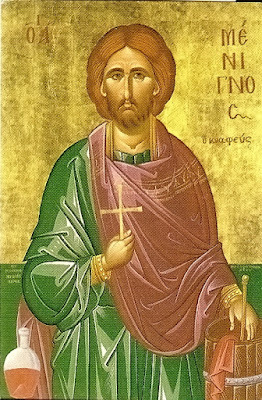 One of the brothers saw the Saint in a dream, who informed him that they forgot his head from which he confessed Christ. 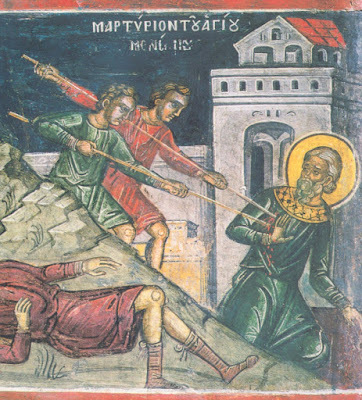 Waking up his brothers, they returned to the place of the Saint's martyrdom, and although it was dark, a divine light shined on the head so that they were able to locate it. They therefore returned, united the head to the body of the Saint, and proceeded on their way to bury him, but the Saint appeared to them at a certain place, and ordered them to bury him there.